It’s short summary article about my autosomal DNA research results, based on 22 chromosomes and X chromosome of me, my mother and my father. First, I received my atDNA results of FamilyFinder test. I was very surprised, that I have Ashkenazi DNA. Officially, my family (and whole village I would say) don’t have any, and did not have any relations with Jewish people since at least 1900 years. But there were rumors, about potential relationships, so I tend to agree, that Jewish people left their offspring in my village. More than that – I do research right now the history of Galicia (Ukrainian and Polish parts) and I realize many things, I hadn’t know before. So I wrote small article “atDNA #1 [86-8-6]” with analysis of my results. Then I received my mother atDNA results of FamilyFinder test. I was more then surprised because, I expected to have Ashkenazi injection from paternal line. Then I decided to perform father’s DNA testing to be sure, from which line I received Ashkenazi and Asia Minor and how much. Results were “3rd-level surprising” – father has no Ashkenazi at all. Here is snapshot of FF results, during 2015/2017. The most European in my family is father (91%), then me (86%) followed by mother (84%). East European. My father looks more Eastern than me and my mother, which might be the sign, that father’s ancestry somewhere from Poland or close to. South European is about my Balkans genetics. Strange and surprisingly, but my mother has more South European genes, which might be sign that her ancestry has more ethnicity admixture from that part of Europe. My mother atDNA says 10% of Ashkenazi ancestry, which means that her ancestry had relations with Ashkenazi Jews. And based on pure Math, it should have been one of her 64 3x-great grand parents (no idea paternal or maternal). I’m in progress of clarifying this on genealogy/etymology and genetics levels of my research. I received smaller amount (8%), and that is why I should have had her DNA results (to get more clarified details on FTDNA matches page). In regards to Asia Minor, this kinda guess, but mostly I connect this with history of Ukrainian relations with Tatars and Ottoman Turkish people. Because in my genealogy, we have a few people with dark hair and brown eyes, who might be descendants of mixed marriages. Especially my paternal grandmother with her father surname Jurczylo, came from the ancestry in village Pniow, which was very populated by Tatars in 1600-1650 years. But I am not sure yet about this all. Recently, I have nice discussion with my “5th Cousin from Turkey” and she mentioned such ethnicity as Gagauz people, who speaks Turkish; mostly follow Christianity but also Islam; belong genetically to the Balkan population; located mostly in Moldova and belong to Y-DNA haplogroups I2a (23.6%), which is the same haplogroup as I have. Surprising, that Ashkenazi 10% + Middle Eastern 5% now disappeared. And mother become now 100% European. Dunno what to say good or bad, but before 2014 I thought my mother really European, then in 2014/2016 I believed in Ashkenazi ancestry, because history tracing have some doubts and suspicions, and now all changed. Anyway, I know FTDNA Matches list, and lot of people in mother’s list are from Jewish ancestry/DNA. So by some degree, I believe mother’s genetics somehow but related to Eastern European Ashkenazi ancestry. Not sure, which part os Ashkenazi/Middle Easter “transformed” into European, but I see, that Eastern Europe slightly decreased to 57% and Southeast Europe significantly increased to 43%. So I may only guess, that Ashkenazi/Middle Eastern might have been related/transformed/ported to Southeast Europe on Balkans. Potentially it’s related to Moldova/Bulgaria ancestry. Middle Eastern 9% I may say, that now kinda disappeared. In fact, it’s divided now into other smaller trace results: Southeast Asia < 2%, Siberia <2%, West Middle East <2%. Even such small, but anyway most unexpected is Southeast Asia, because in father’s heritage none was from any at least a bit related regions. Siberia is interesting, because recently I found NON-verified by Internet record about Lundiak Georgius from North Russia, which could have been related to Altai ancestry, and later to Siberia. NON-YET-VERIFIED/PROVED. Also, in combination with Middle East, this might be the sign of old Tatars ancestry, not sure if this might be true, but need to research. Eastern Europe also decreased to 74%, and Southeast Europe increased to 24%. Common among me, my mother and father is the fact of European ancestry slightly increased. For me now it’s 94%. And considering, that Ashkenazi passed to me from mother, I also have decreased level of DNA from 8% to 2%. No I am more European person, less Ashkenazi, and less Middle Eastern. But what is really interesting, that now I can see and believe in my previous suspicions, that even FTDNA doesn’t show Ashkenazi DNA in my father’s genetics, I still have some mixed DNA from both father and mother. Because how to explain, that FTDNA doesn’t see Ashkenazi in mother’s DNA, but I have 2%. Still, this should be more researched. More details about my Y-DNA research in my article “I2a1b2a1 aka I-CTS10228“. More details about “Surnames and Locations” is keep-updating article, where I collect all data since I do my genealogy and genetics research. My family was born on West part of Ukraine village Molodkiv (in region of Galicia near Pokuttya) and I trace my genealogy till ~1730 years, and no relations with other countries whatsoever. I guess that my ancestry might have had relations with Poland, but no official facts/documents. So far I don’t have much details about South-West Europe and Turkey areas, nevertheless on FDTNA Matches page me and my parents we have many people from USA (mainly migrants from Poland or Ukraine, including Jewish people), Poland, Germany, Italy, Bulgaria, Croatia, Hungary, Moldova and yes even Turkey. Sure thing, we have matches with Ukrainian people, but they mostly from West Ukraine or East Poland or East Belarus, and even South-East Lithuania small number of people are from Russia or even South-East of Ukraine. Now, maps are different for me and my parents. Father’s map now reflects new segments from Siberia (Russia/Yakutsk), Southeast Asia (Laos, Thailand) and West Middle East (Israel/Syria). But it’s < 2%, so relation was very old and with no information from genealogy AT ALL !!! My map reflects Ashkenazi ancestry with centrum in Poland and Middle Eastern ancestry from Turkey. Interesting, that neither mother nor father ancestry don’t intersect with Turkey. I would say, it’s good, that company does something in regards to updating. But as far as I researched many replies from people, they re mostly surprised about new results. Especially people from Sephardic Jews discovering they have Ashkenazi ancestry and vice versa. For me is surprise, how I can have Ashkenazi and my mother/father no. Currently I explain, that both parents have Ashkenazi, but the threshold is small for them, but when DNA combined in my DNA, I accumulated Ashkenazi DNA from both. 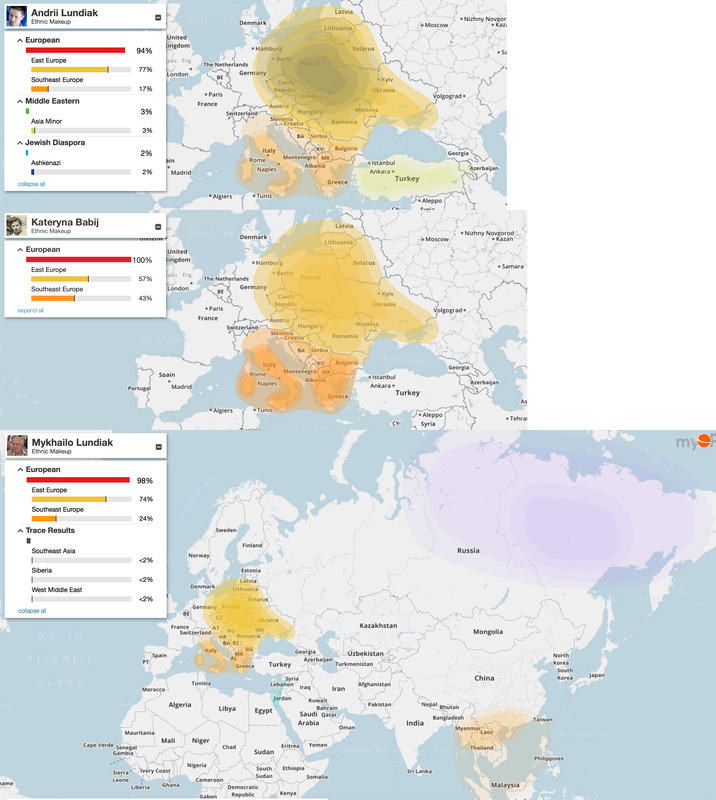 Also surprise for me, that very small part of father DNA which most probably point to East Russia ancestry. No clue at all, but now I will be working on history/genealogy research in this direction. An Undetermined Region result means that you have a small section of autosomal DNA that we cannot, with confidence, match to any of our reference populations. FTDNA gives raw data – compressed CSV file, which contains 22 chromosomes data concatenated with X chromosome data. And that format is widely used by 3rd party services. One of which is DNA.land. They have recently updated their donut chart to pie chart, and I remember their old approach – described/analyzed it in my article “atDNA #2 [dna-land]” published this year. Nov-2015 I did first upload of my raw data. Feb-2016 I uploaded raw data of my mother. I did a few screenshots of web page charts. Apr-2016 I prepared to publish an article, and spotted on new DNA.land update, and at that time, my mother’s pie chart looked this way. There was mention of “Italian” ancestry explicitly on chart. But later they changed it, and it became “South/Central European” which is reflected at the current moment for my mother’s old account on dna.land site. Oct-12-2016 uploaded my father’s data. Old one (Apr-2016) in green colored section. New one (Oct-2016) in red colored section. There are slightly different results, so to understand new approach, I want to highlight difference with previous approach. In general, we are all 100% West Eurasian descendants. According to DNA.land North European ancestry percentage for everyone of us composed by North Slavic ancestry. My father has more Slavs DNA (71%) and me with mother have less. It might be the sign, that his ancestry is more North Slavic than my mother ancestry. And it’s not his direct male line, because he and myself we are male descendants of south European I2a yDNA haplogroup. Not sure if I am correct, but assuming my mother has 18% and my father has 19% as a result of “good” DNA mixing I have 24% of South European. It’s very interesting point, because before my parents DNA results came in, I thought only about paternal ancestry in regards to South Europe. Now I have more thoughts in research. 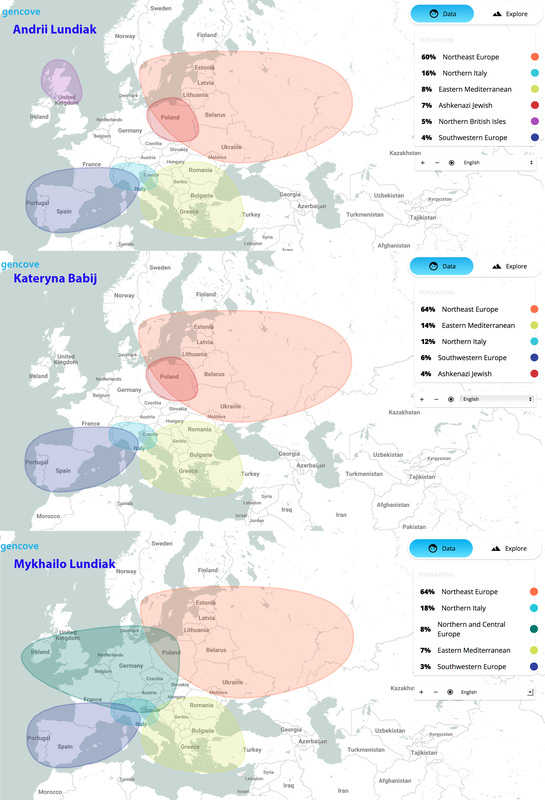 DNA.land is clear in definition of South European admixture for my father, and divide it into 16% Balkan and 3.7% of South/Central European. But for me and my mother there is percentage of Ambiguous segments (2.3%, 3.6% accordingly) and rest is South/Central European. Interesting thing about Southwestern European, DNA.land didn’t define any section in my DNA (assuming I have yDNA ancestry from Balkans so called Dinaric race) but they defined 3% of Southwestern European + 3% of Sardinian for my mother and solid 9.9% of Sardinian only for my father. It might be related with the fact, that my mother has more FTDNA matches with Italian people, even including mtDNA matches. 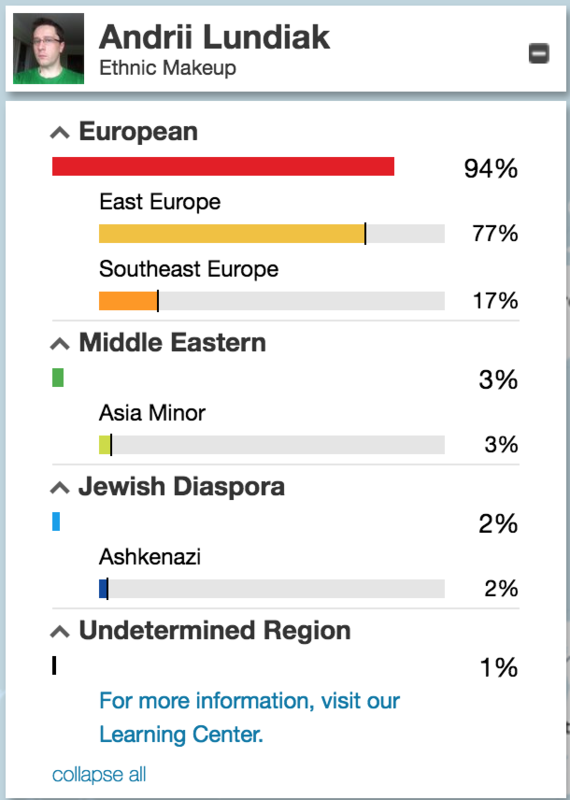 In regards to Ashkenazi part, DNA.land found 3,7% in my atDNA and 11% in my mother’s but under the name “Ashkenazi/Levantine” atDNA dividing into 2 segments: Ashkenazi 8.2 % and Ambiguous 2.3%. The same as FTDNA, DNA.land algorithm doesn’t see in DNA criteria to says about Ashkenazi for my father. We found no specific Balkan ancestry, but we did find 2.3% ambiguous South European ancestry, which could be Balkan. old Ambiguous 2.3% in South European became Balkan 3.8% and together with South/Central European 29% they define “South European” 33% with is more than by previous old logic. 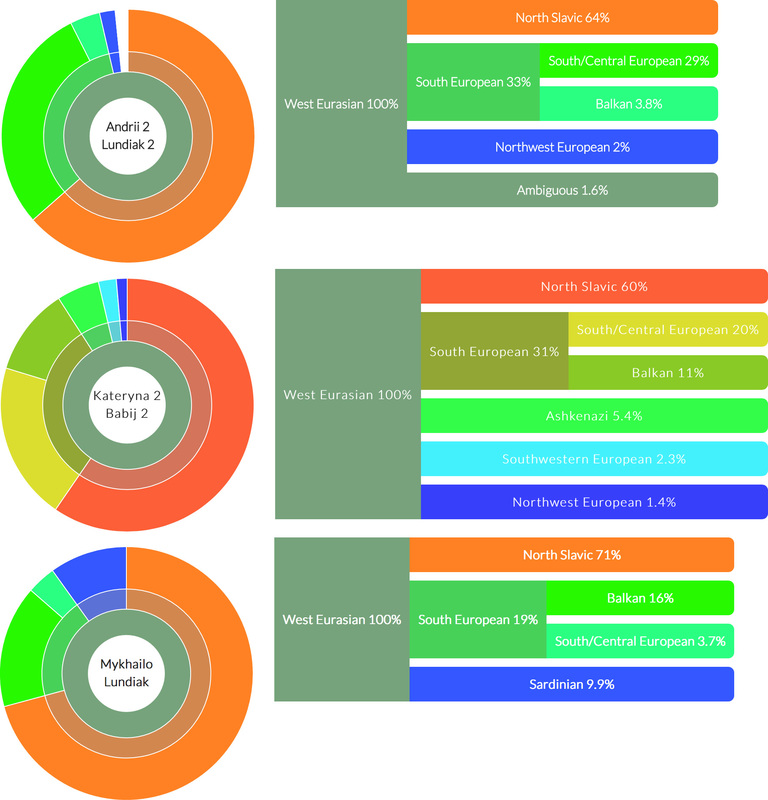 We found no specific Ashkenazi ancestry, nor Ashkenazi/Levantine ancestry, but we did find 1.6% ambiguous West Eurasian ancestry, which could be Ashkenazi. And I think it clarifies something, but also kinda “hide” my very low level/amount DNA matches. old value of North Slavic has been decreased to 60% (no it’s closer to the data from FTDNA – about the fact that my father is more European than me and mother). old South European has been increased to 31%, which does mean that mother is more southern European than me and father. Contains South/Central European for 20% and instead of old Ambiguous now we have new Balkan with 11%. 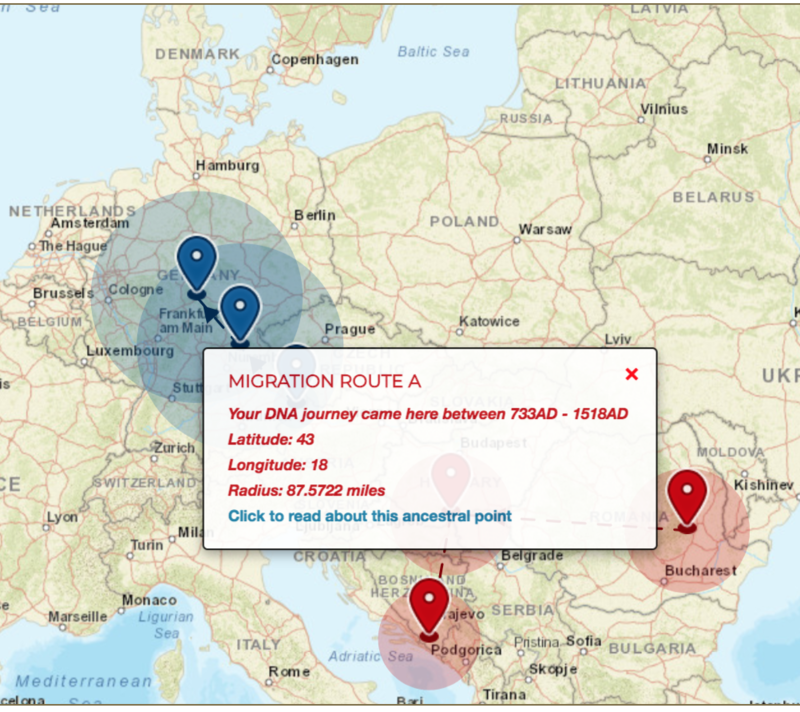 DNA.land has also “Ancestry Map” which is quite similar to FTDNA “myOrigins” map. I’ve already analyzed such map for my results in article “atDNA #2 [dna-land]” and here I will analyze differences between my parents an me. I can clearly say that I’m “mother’s son” because our maps are very similar, and it’s due to commonly shared Ashkenazi/Levantine ancestry with area explicitly in Poland and Lithuania. DNA.land shows, that father DNA has no matches with common Ashkenazi areas/ancestries. On the other hand, Lithuania is also country, where 3 of us has North Slavic ancestry. Also Belarus, Estonia, Ukraine and even Mordovian and Russian. I think it’s explained by the fact that Ukrainians as ethnicity is very related to Russian, Belorussian. But Mordovian it’s new for me. Kinda interesting and surprising for me, that Italian ancestry is common for all of us. Me and my parents we have DNA.land-defined matches commonly fond in Bergamo and Toskana areas. This is 2nd DNA.land opinion which is the same about me and my parents. First was about North Slavic. On new map (Oct-2016) my Ashkenazi region not quite disappear, but became Ambiguous, as I mentioned above. I also update my old dedicated article “atDNA #2 [dna-land]“. UPD: Uploaded raw data from FTDNA to DNA.land Jun-21-2017, and results are the same as Oct-2016. So I may assume.algorithm was settled down, and treated as stable. My Ashkenazi segments/areas did not disappear, it’s simply is lower than mother’s, so DNA.land define it as Ambiguous. So it’s good sign about my further research of Ashkenazi, and now I know it’s definitely related to my mother. 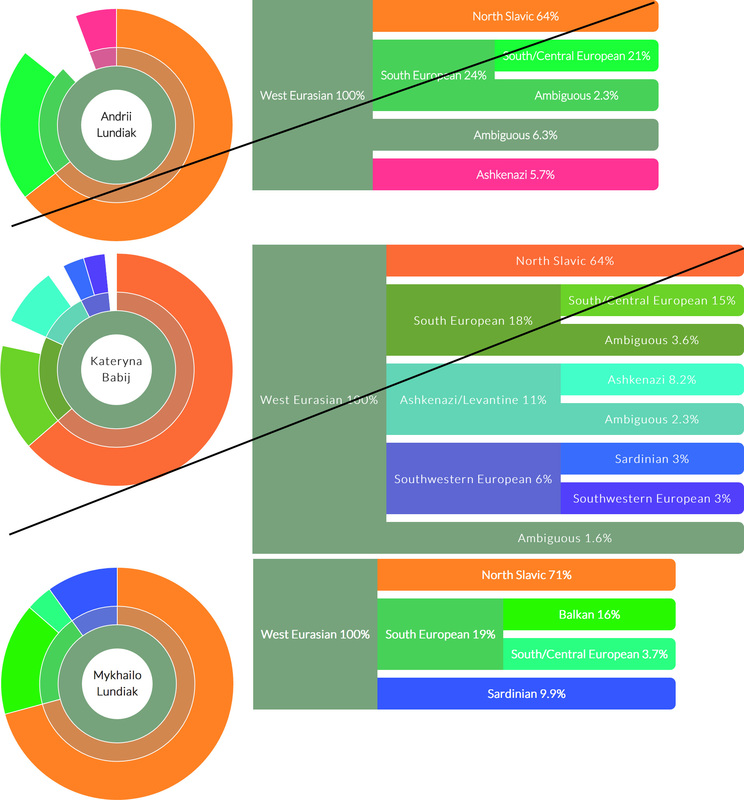 Comparing the majority of “Europeanity” by FTDNA, DNA.land defines it a bit different, in “edges” way. 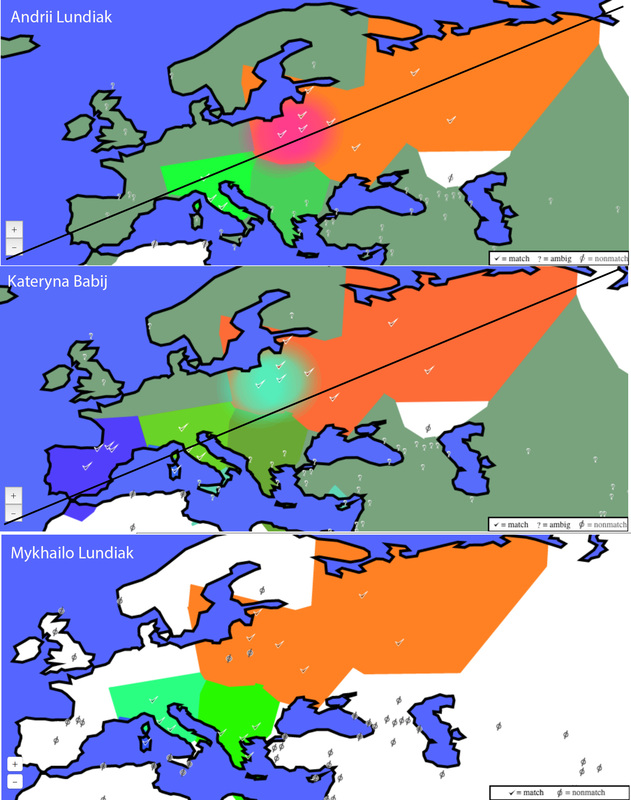 Instead of Eastern Europe, DNA.land defines solid North part and not very confident South part looking into more South/Central part. North Slavic (European) has been clarified more into father’s ancestry and Southern European into mother’s ancestry. 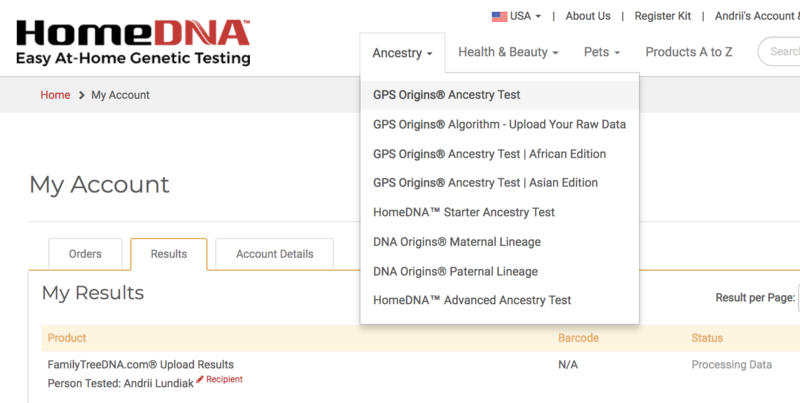 Starting December 16, 2018, users can upload their raw DNA data from other testing services for free, and they will still receive all DNA Matches for free, but unlocking extra features for uploaded DNA data will cost an extra fee. Below are my results for Ethnicity Estimate. Slight changes for mother and father. No changes for me. Ethnicities per person 2017 version. For mother: East European 61.2% => 62.5%, Balkan 30% => 29%, Ashkenazi 2.7% => 2.8%. For father: East European 52.6% => 51%, Balkan 32.8% => 32.7%, Baltic 12.3% => 13.7%, South Europe 2.3% => 2.6%. East Europe 91.2% for me and 91,5% for my mother, nearly the same. Also, my father has Baltic segment, which is not shown for my but I suspect it is, but just very small amount. It also gives more thoughts, that ancestry of my father is closer to North/East/Baltic geography and my mother’s ancestry to South/East Europe. Maybe, MyHeritage did a mistake, because Baltic is closer to the term “North European”. In general, it looks like my father is more East European (97.4%) than my mother and me. But in details, father looks balanced between Balkan, Eastern Europe and Baltic, which defines his ancestry as vertical (from Croatia via West Ukraine to Lithuania) and mother with me are more into Eastern European direction (with less Balkan percentage but more Eastern genetics). South Europe 5.7% for my mother (Iberian 5.7%) shows and proves one more time, that mother’s ancestry is closer to Southern Europe (potentially Moldova). I have South Europe 5.6% (Iberian 4.7%, Italian 0.9%) and father has the lowest level 2.6% (Italian 2.6%), which is sign that father’s ancestry is farther from South Europe. This is a bit strange and I have suspicion, that Iberian might represent Sephardic Jews. If so, that it would explain, why old algorithm by FTDNA showed Ashkenazi Jewish diaspora for father, because FTDNA could distinguish at that time (2014-2016). Ashkenazi Jewish 2.8% ancestry for my mother, and as expected I have less amount of Ashkenazi DNA – 1.2%. This somehow correlates with old FTDNA algorithm and DNA.land results for me and mother. Father’s DNA materials are treated by MyHeritage as non-Ashkenazi, which is almost the same same as by FTDNA (old and new algorithm) and DNA.land. Middle East 1.2% for me but zero for mother and father. It’s strange, because it’s almost the same as by new algorithm from FTDNA in Apr 2017. Before that, we all had Middle Eastern segments in DNA. 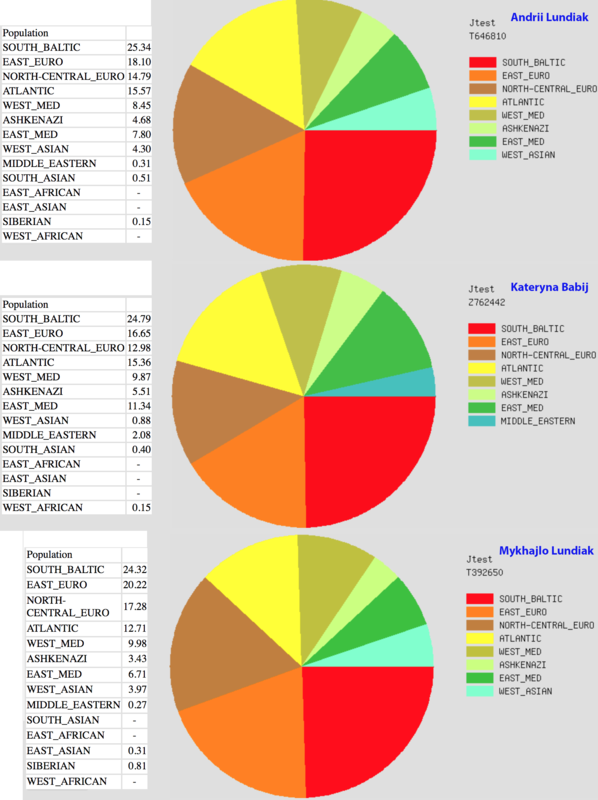 Very small, but still Oceania / Melanesian 0.8% shows only for me, but I guess it’s from father, because FTDNA new algorithm shows < 2% of SoutherEast Asia which correlates with Melanesian region. But I have NO IDEA, how this genetic could traced to me. Since ~1750 years, I have no official Asian or moreover far South Asian people. 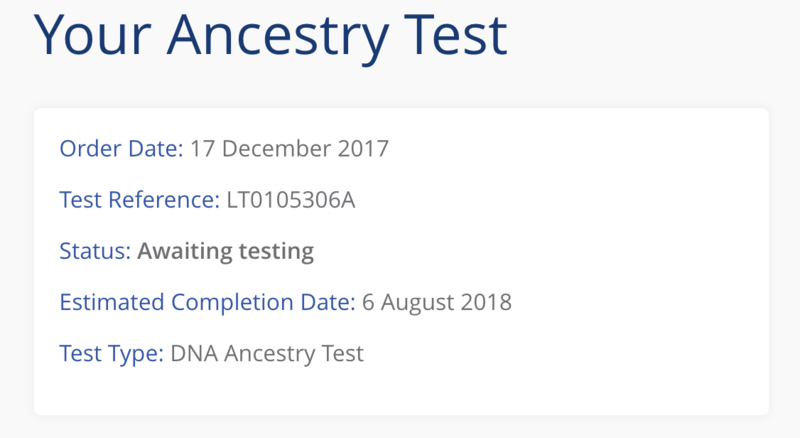 In Sep-2017 I did upload FTDNA raw data of me, my father and mother to this new service. And here are results. 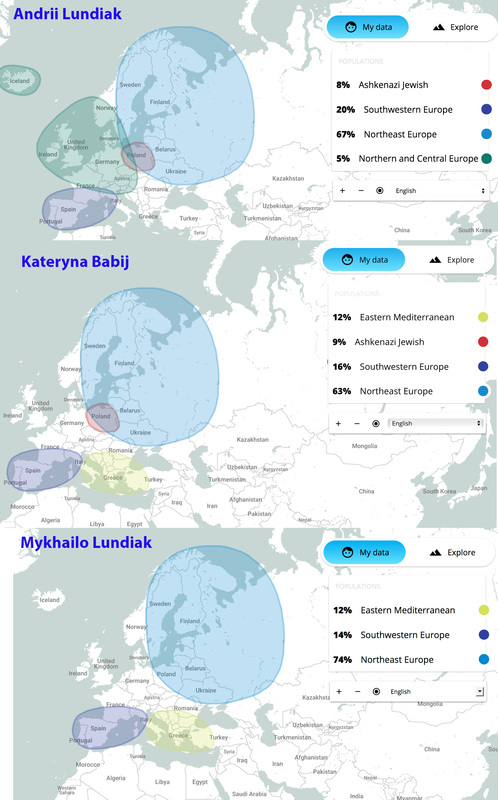 NorthEast Europe is 67% based on my DNA data, and again, this is one more time proof, that it came to me from both parents in quite the same level – father 74%, mother 63%. The most probably it is about Ukrainian, as proto-Slavic, most probably Venedi tribe roots. SouthWestern Europe ancestry represented by 20% on my data, and I treat this as composed DNA amount from my mother (16%) and father (14%). And most probably this is is about ancient Ruthenian tribes, derived from White Croatians. Need to research more detailed. I also have new section Northern and Central Europe with 5%, but neither my father nor my mother have it. I guess, it’s either the way how Gencove analyzes Northern genetics, or my parents have very small amount of it, but composing in my genetics, it gives valuable 5%. On the other hand, my father and mother they both have 12% of East Mediterranean with location in Greece. NorthEast Europe now, is clearly shown as balanced – my both parents on the same level, and as expected I derived smaller amount of DNA from that region. Changed from 67/63/74% to 60/64/64% respectively. East Mediterranean increased from 0/12/14% to 8/14/17% respectively. new Northern Italy as 16/12/18% respectively. But I guess, it’s due to SouthWestern Europe decrease. SouthWestern Europe values has been significantly decreased for all of us (from 20/16/14% to 3/6/4% respectively), meaning that we become now less Balkans people. And it’s expected, because despite the fact we may be related to Croatian tribe, but we are far away and evolved by our own as tribe. Northern Central Europe, shifted between me and father. Changed from 5/0/0% to 0/0/8% respectively. Aszkenazi amount decreased for me and mother from 8/9% to 7/4% respectively. Some companies/services show that I have bigger number and some that mother have. Considering latest change in Aszkenazi/Sephardic/endogamy-like research, this value is constantly decreased for people who are less Jewish as original Mizrahi Jews. But for sure, almost all services gives my father either very small number or zero amount of Aszkenazi. new Northern British Isles 5% for me only. They don’t support FTDNA raw data format, so upload failed. Later on, admins deleted that wrong data set from me, which gives me ability to upload again. And I assume it’s because I also uploaded data to MyHeritage time ago. Maybe, support request/email will help. #TODO. Ancestry Composition is different than others companies. I think it’s because of database they have contains many Americans, and that is why my genes found similar to nowadays Americans (who time ago migrated from Europe). 54.72% – just a bit more than 50% I’m European. Funny. 24.98% West Asia and Middle Eastern. Yes, I have it from FTDNA, MyHeritage but less value for sure. 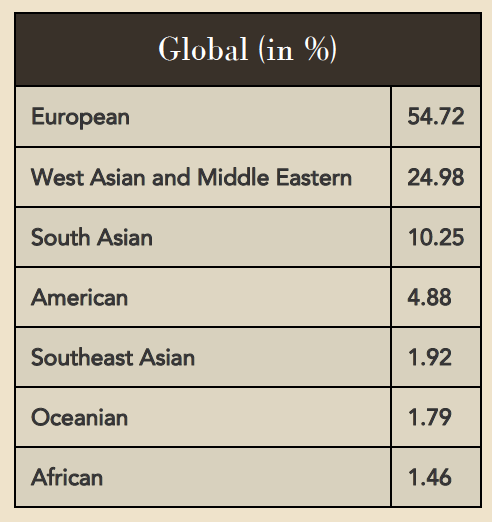 10.25% of South Asian, and 1.92% of SouthernEast Asian, really? 1.79% Oceanian, ok it’s known for me as result from FTDNA and MyHeritage, but there I have less then 1%. 1.46% African. OK, if it’s ancient DNA, then I’m fine. But it’s odd. Not sure, but looks like XCode.life made the threshold very very old/deep/low, so I suspect ancient DNA reflected on data. So if to look European part detailed, then Lithuanian is majority. This fact is kinda known for me, because other companies also shows similarity with Lithuania people/genetics. And also Italian is one of South Europe is always shown for me. It’s strange, then Russian is 3rd in list, and considering, the Russia is not Europe. Ukrainian as a ethnicity might be old, but as a nationality is quite young. 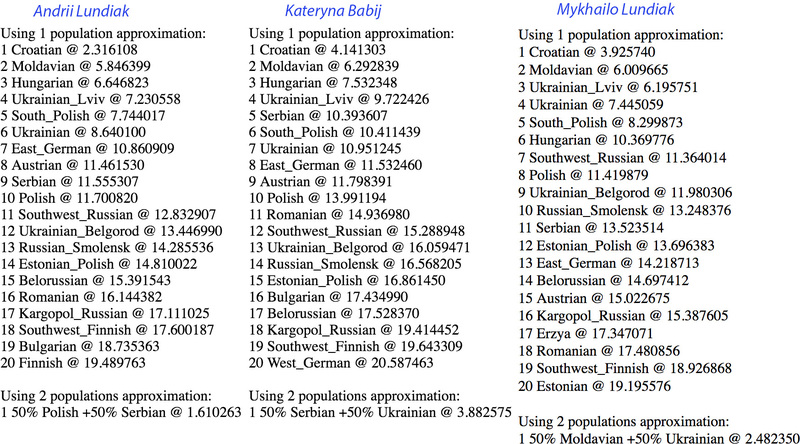 If it’s really USA based database/statistics, then Ukrainian genetics must have be represented well enough. Odd. Ancestry Wheel is a visual representation of Ancestry Composition. Aug-18-2018, I uploaded my FTDNA raw data to the HomeDNA web site, with expectation for “GPS Origins” test results. In fact there is shared version, here is LINK, but I’m not sure how long HomeDNA will support it. 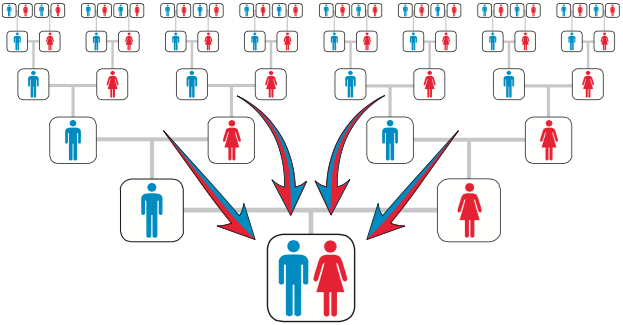 GPS Origins test is an Autosomal (SNP) test that is not gender specific. Although both Migration Patterns represent your Maternal and Paternal DNA routes, we do not differentiate which route is maternal and which is paternal. And here are 2 migration routes. 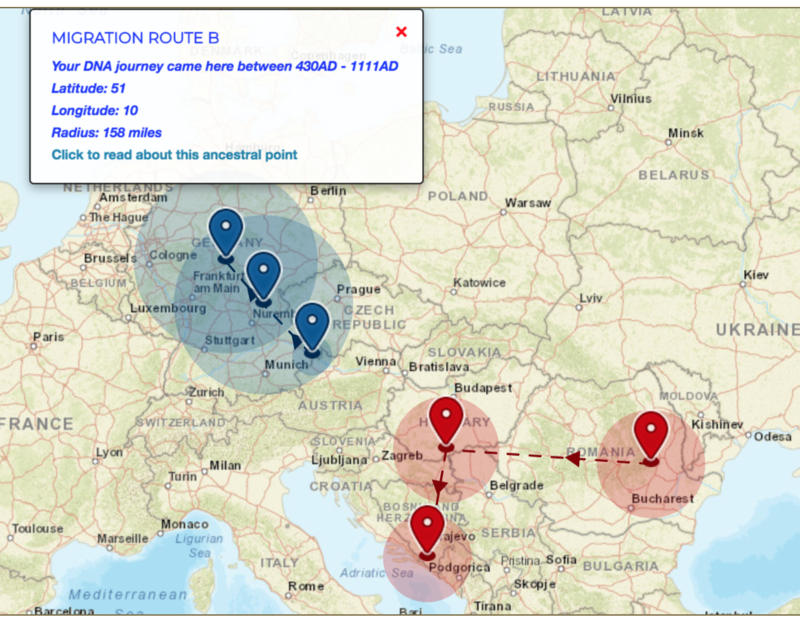 This route reminds me part of genetic matches location for my mother from FTDNA, MyHeritage and GEDMATCH – there are records from Moldavia, but also yDNA matches, where a few matches are from Romania and Hungary. This doesn’t clear up (show) whose side this migration is – both my mother and father do have DNA matches in this region. 820 AD – 1354 AD – in generated PDF file for Story A. 733 AD – 1518 AD – shown on final, 3rd point on map. 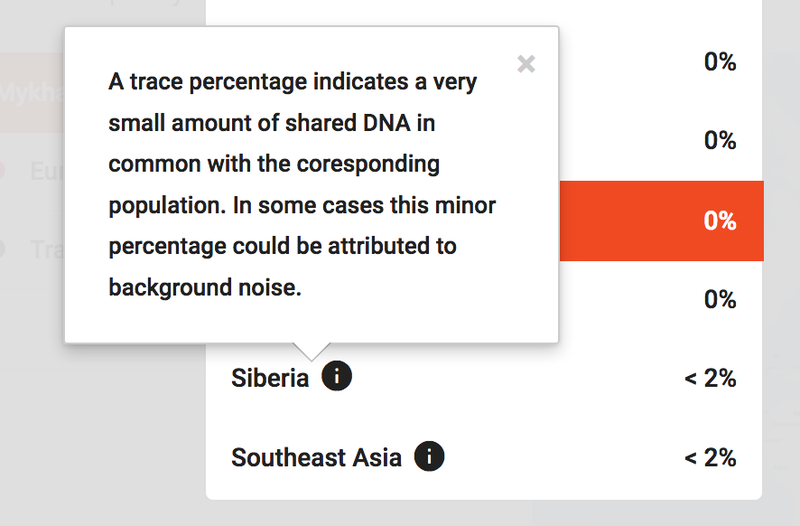 Not sure, why it’s different, but I guess that first date range, on tooltip on map shows wider, global range for all migrations, but this date from PDF shows narrower dat range, I guess for my DNA samples. NOT SURE AT ALL – my GUESS ONLY !!! Blankenbach (Central Germany, between Dortmund, Frankfurt am Main and Leipzig) – bigger, but the same radius as for Beyruth. 430 AD – 1111AD which is shown on tooltip for final, 3rd point on map. So looks like both migration were both from East to West, and caused by Huns, Alans and later Avars who pushing out people who were living at that time to West and West-South. There was also migration to Germany from North – from Scandinavian aka Fenoscandinavia, from Poland and also from Eastern Europe. 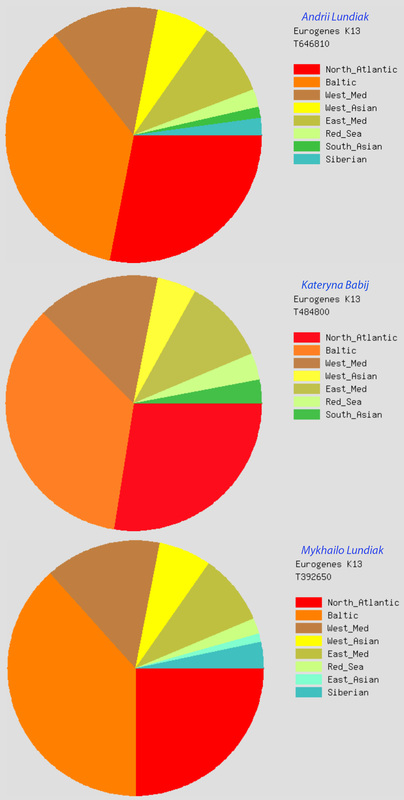 Majority shows, that genetics is from North Europe. Which is relatively the same as in other companies results. BTW, it also shows Central America 🙂 for 0.9.% and “Western South America” for 0.3.% which is still surprise for me, but not as much as in XCodeLife (4.88%). Anyway, I more confident, that this is influence of the fact it’s USA based database. !!! It also shows “The Souther Levant” for 0.4% witch I guess related a very bit to Ashkenazi Jews, but very far. Because Levant is rather “Middle Eastern” area not Europe. This all is very interesting 🙂 Exported PDF files contain lot of text to read about these migration and the history on background. It’s short, but well enough to grasp by people who don’t know history so good as Historians. This is another free service for genetics research. I mainly use it for getting matches, but they also have a few interesting micro-services for ethnicity analysis. So called “Admixture (heritage)” can be generated based on different projects. Projects have calculator(s) based on which generation is processed. A few variants of “proportions” based on different calculators. First, I selected “Eurogenes K13” (which is default, and I expect it to be wide spread/used). looks like, me (28.06%) and my mother (27.45%) are more North Atlantic than my father (25.01%). and father (38.32%) looks more Baltic than me (36.38%) and my mother (35.14%). I’m less West Mediterranean than my parents. (me – 13.57%, father – 14.59%, mother – 15.55%). North Atlantic is mostly defined by chromosome 14 for me and my father; by chromosome 1 for my mother. Baltic is mostly defined by chromosomes 9 and 21 for me and my father (in different values but still); by chromosomes 22 for my mother. And only in 2018, I discovered/faced with Euoregene but calculator “JTest” (thanks to @Piotr Lewandowski). I don’t why, but I don’t remember this JTest when I initially looked to GEDMATCH. South Baltic 25.34% for me, 24.79% for mother, 24.32% for father, which shows we all on the same level, and it shows, that approximatelly, I inheritated the same level from both parents. East Euro 18.10% for me, 16.65% for mother, 20.22% for father. Which one more times shows, that mother more South Baltic than father, and less East European than father. But in regards to me, looks like I inheritaed more from South Baltic, meaning from mother ancestors. North-Central Euoropean 14.79% for me, 12.98% for mother, 17.28% for father, which one more tiems prove, that father is more North person than mother. Far from Ukraine, but still Atlantic is 15.57% for me, 15.36 for mother, 12.71% for father. Not sure, but might be sign of Spain/France and very deep/far endogamy from Sephardic. Hope FTDNA will clarify more in 2018. Note (theory/guess): I do research atDNA matches based on FTDNA and GEDMATCH, and chromosome 9 is very frequent in Ashkenazi Jews ancestry. So taking above Baltic conclusion, I may suspect, that those Ashkenazi ancestry (8% in me, 10% in my mother) came from Lithuania rather from Poland. But I’m in research progress, and I will publish results soon. MDLP (MDLP K23b, World 22, World) works on race level and Hunter/Gatherer vs. Farmers level. Not sure how it’s correct, but that project gives me high level of Austronesian, which might be either a mistake or ancientDNA analysis only. Dodecade (Dodecad V3) also works on Hunter/Farmers level. HarappaWorld works better for Medditerranean. Ethihelix works better for people from Japanese/Palestinian/Africa/France areas. puntDNAL (calculators: ancient, modern, african) works with EarlyFarmers vs. HunterGatherer level. GedrosiaDNA as the name says is dedicated to Gedrosia area. 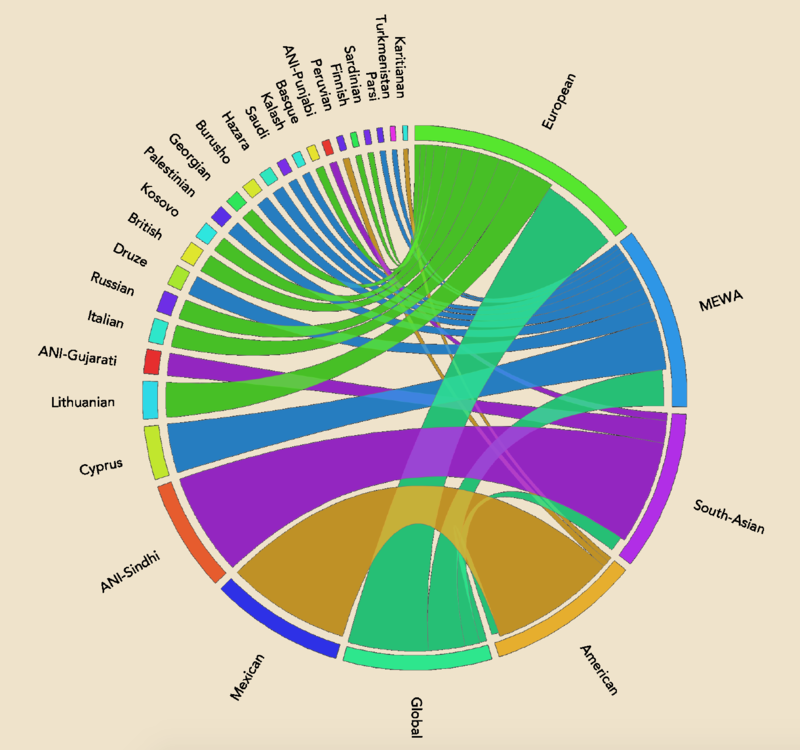 But even for Eurasia region it shows EarlyFarmers vs. HunterGatherer percentage pie chart. Our DNA defines our ancestry mainly as Croatians (despite the fact we all 3 born in Ukraine (West), and our ancestors since ~1730 years were also IN THE SAME PLACE – village Molodkiv (in region of Galicia near Pokuttya) ) . I think it’s because of matches with Balkans DNA/ancestry. And also I think it’s one more proof, that my ancestry might be related to White Croats. Moldavian is also common for all of us. Again, it should be related with Balkans ancestry, but also mixed with Romanian somehow. It’s again valid detail in regards to White Croats. 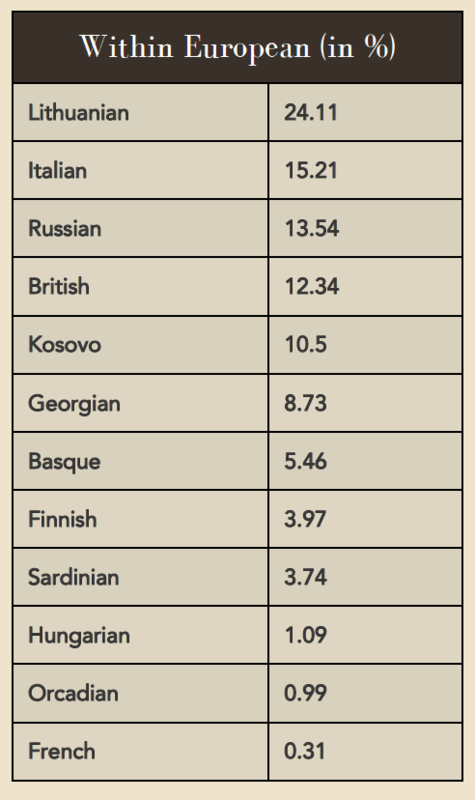 Hungarian is one more ethnicity, which gives more questions rather answers. Ukrainians ancestry is on 4th step/grade/compare-level. BTW, this above analysis is all about ONLY 22 chromosomes (and maybe X chr.) but NOT y chr. or mt chr. Regarding Y-DNA research there is theory, that my male ancestry (I2a-Y4660) were Vistula Veneti, and Stanisław Plewako (one of administrators FTDNA Baltic Sea group) works on it. From the 4th until the 7th century, Slavs who lived in that area and to the West between Dniester and Dnieper in the medieval sources were known as Antes. It is thought that White Croats were part of the Antes tribal polity who migrated to Galicia in the 3rd-4th century, under pressure by invading Huns and Goths. They lived there until the Antes were attacked by the Pannonian Avars in 560, and the polity was finally destroyed in 602 by the same Avars. In 1485, Moldavian prince Stephen the Great, after losing in the previous year his country’s exit to the Black Sea to the Ottomans, was in serious need of alliances, and swore allegiance to Casimir IV Jagiellon, King of Poland for Pokuttia, in what is known as the Colomeea oath. However, Casimir’s successor John I Albert of Poland, used the treaty as a pretext to invade Moldavia itself in 1497, but after four months of siege, failed to conquer the fortress of Suceava, Stephen’s capital. Moreover, when abandoning the siege, his army ran into a trap, was decimated, and many nobles were killed. See Battle of the Cosmin Forest. After that, in 1498, Pokuttia was conquered by Stephen the Great, annexed and retained by Moldavia until the Battle of Obertyn in 1531, when it was recaptured by Poland’s hetman Jan Tarnowski, who defeated Stephen’s son Petru Rareş. Minor Polish-Moldavian clashes for Pokuttia continued for the next 15 years, until Petru Rareş’s death. UPD 2018 – Fresh thought about Italy vs. Polish vs. Ashkenazi ares. Time ago, there were merchants in Poland, and they were requested by Kazimierz III somewhere between 1300-1400 to go to Poland and start business and enrich the lands. Those merchants were mostly Jewish people and also Italian (Włochy), and they settled in Poland and left their offspring. My village Molodkiv was at those times under the gov. of Poland and later closer to 1400 under Moldavia. But many merchants migrated also to our lands, and they settled manufactures of NaCl salt, and we ahd a few mines in village. And the village in fact was small town, and popular during 1700-1800. Later on Austria took th gov. and salt mines were droped, and Polish merchants returned back to Poland I guess. Wiki “Historia Żydów w Polsce“: W 1334 Kazimierz Wielki wyciągnął Żydów spod jurysdykcji prawa niemieckiego i od tego czasu gminy żydowskie bezpośrednio zaczęły podlegać sądom królewskim. Od decyzji Kazimierza Wielkiego chroniącej bezpieczeństwa i interesów Żydów, Królestwo Polskie stało się przystanią bezpieczeństwa ludów semickich wygnanych z całej Europy. Od czasów powstania Królestwa Polskiego, poprzez utworzoną w 1569 Rzeczpospolitą Obojga Narodów, aż do okresu klęsk wojennych powstania Chmielnickiego i potopu szwedzkiego w XVII w., Polska była jednym z najbardziej tolerancyjnych państw Europy, stała się więc domem dla jednej z największych i najdynamiczniej rozwijających się społeczności żydowskich. Resource “ŻYDZI W POLSCE”: Liczbę Żydów w Polsce ocenia się w owym czasie (koniec XIV – początek XV wieku) na około 10 tysięcy osób. Kolejny król polski, Kazimierz IV Jagiellończyk (1427-1492), zniósł nawet wszystkie antyżydowskie przepisy kanoniczne zalecane przez papieży. Od tej pory w Polsce nie wolno było pozywać Żydów przed trybunały duchowne, a wojewodzi mieli bronić Żydów przed ewentualnymi napaściami kleru czy motłochu. Jednocześnie Żydzi otrzymali własne sądownictwo. Nie trzeba podkreślać, że była to sytuacja wyjątkowa w całej Europie. Szacuje się, że pod koniec Średniowiecza (koniec XV wieku) Żydzi mieszkali w około 85 polskich miastach, a ich liczbę ocenia się na około 18 tysięcy w Królestwie Polskim i około 6 tysięcy w Wielkim Księstwie Litewskim. Ale Żydzi to nie tylko finanse i handel. Żydzi przywiązywali także zawsze wielką wagę do wykształcenia. Szczególnie słynne stały się polskie szkoły talmudyczne i polscy rabini, jak Mojżesz Menz, który w roku 1469 przywędrował z Moguncji do Poznania, oraz Józef Polak, który przybył z Pragi do Krakowa, gdzie w latach 1490-1530 prowadził słynną w całej Europie uczelnię talmudyczną. Po roku 1492 zaczęli napływać do Polski Żydzi wygnani z Hiszpanii i Portugalii. Bardzo często byli to bogaci kupcy oraz finansiści, którzy szybko nawiązywali lokalne kontakty i przyczyniali się do rozwoju żydowskiej przedsiębiorczości. Od XVI wieku Żydzi rozszerzyli też swoją aktywność gospodarczą na nowe zawody, jak kuśnierstwo, kamasznictwo, tkactwo, powroźnictwo czy szklarstwo. Wraz z przyjazdem do Polski królowej Bony (1518) przybyli wraz z nią z Włoch także wybitni żydowscy medycy, oraz następni bankierzy i kupcy. Zwłaszcza cenieni byli bankierzy, gdyż ratowali władców z opresji finansowych i dostarczali pieniędzy skarbowi państwa, potrzebnych między innymi na prowadzenie działań wojennych na wschodniej i południowo-wschodniej granicy Rzeczpospolitej. Szlachta również zabiegała o życzliwość Żydów, gdyż profitowała poprzez te kontakty przede wszystkim na handlu produktami rolnymi (eksport zboża przez Gdańsk do Amsterdamu). Resource. Drugą grupą byli Żydzi sefardyjscy („Sefard” to hebrajska nazwa Hiszpanii). Zmuszeni do opuszczenia Hiszpanii w latach 1492–1497, migrowali na północ, do Holandii i Anglii, lub na wschód, wzdłuż wybrzeży Morza Śródziemnego do Włoch, na Bałkany, Bliski Wschód czy do Afryki Północnej….Lekarzem królowej Bony był przybyły z Włoch sefardyjczyk Samuel bar Meszulam. Rola finansistów żydowskich jako bankierów rodziny królewskiej – typowa w czasach Kazimierza Jagiellończyka – w XVI w. osłabła. This research will be continued and I plan to publish more details. Since I’ve got atDNA results for my mother, I do research of Ashkenazi/Levantine dna/ancestry/history, in particular in West/South Poland, so that I can find more detail about potential ancestry and relations in past. Also Lithuania, as North region it became source of Slavs and Ashkenazi for my research. North vs. South European is 2nd and 3rd directions of my research. In particular – Balkans vs. Gagaguz vs. Moldawian vs. Hungarian. I know that in this DNA/genetics research there may be errors/mistakes/not correct data. But I have what I have – DNA data, and I do different analysis to clarify all edge cases to be more confident. There is no very confident point in any research directions I’m doing. Saying so, I know that everything can be changed depends on criterias. As @Val commented on my article “Don’t pay too much attention to the south components of DNA.land, because they float from one to another without any consistent pattern.” I take this concern into consideration for further research and data comparison. 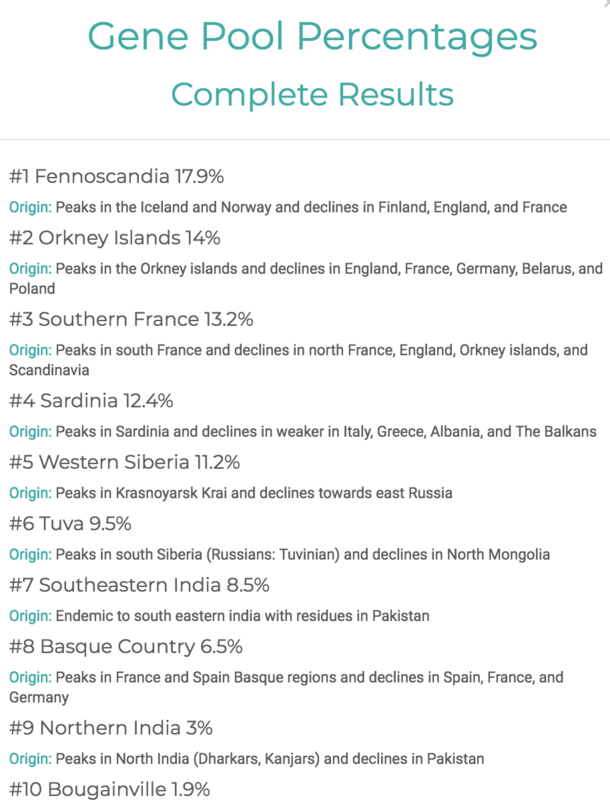 MyHeritage Ancestry Estimate results showed me some correlations with FTDNA and DNA.land results. New for me is Oceania genes, which are small but still. about mtDNA results for my mother. Done – here. about my atDNA matches and analysis how far “Cousins” we are. about ancientDNA, which is very “far away research” but still interesting. about Ashkenazi research and analysis of this DNA direction. about North Slavic and South European relations with Ukraininas/Rusyns/WhiteCroats/Vendi/Duliby/Drewlianye/Dregowychi so that I could cover my own Slavic ancestry. about connection between Balkan people and Slavs. Because in fact, Y SNP CTS-10228 shows, that proto-Slavs were migrated to Balkan countries and left offsprings, and now we have Y SNP I-S1720 and I-Ph908 which are children Y chromosome mutation for CTS-10228. 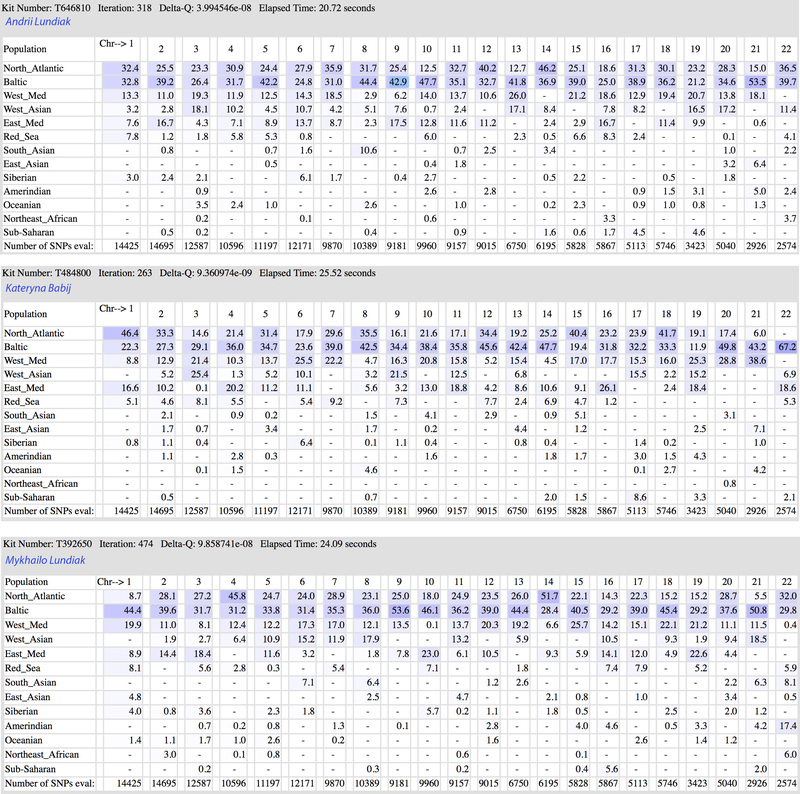 Updated Eurogenes K13 now at GEDmatch. 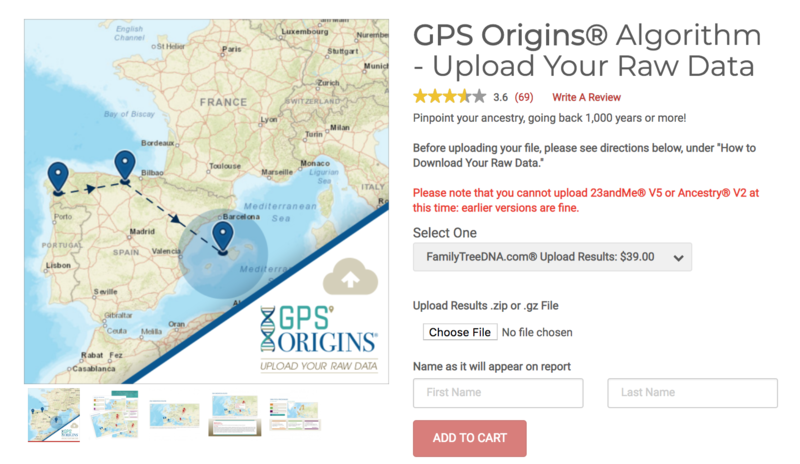 MapMy23 (convert an Ancestry.com raw dna file into a format accepted by FTDNA). Marcia: …more red due to the NW European/N Atlantic and less on Baltic orange… but other is similar. Thanks for such comment. I may review you matches/makeup, but not sure if you expect me to help u with smth. Anyway good to know someone read my article, and in case of questions, let me know. And there’s no mention of any Scandinavian, North European region at all. Which is strange if you claim your Swedish origin. @Donan it’s not strange for me, I don’t claim for SWE origin. I assume, that considering my male yDNA haplogroup – I2a1 … L621 I’m 2nd part of humanity which was derived before Scandinavian appeared as we know now (I1 haplogroup afaik – majority => https://www.eupedia.com/europe/european_y-dna_haplogroups.shtml ). According to results of my autosomal test and history of my ancestors’ historical region – I expect my haplogroup be I2a1b-M423. Let me put this info here), I need to provide result when my BigY is ready.